Spread the word: Get the information out about the contests on every channel you can, from posting on social media to word-of-mouth from older students. More advertising will increase the potential involvement, whether you choose to post, tweet or hang up posters. Click here for the complete set of posters and the Facebook cover photo. Let the incoming class show off how well they can dress to impress with a contest featuring your best branded merchandise, assembled into Instagram-ready outfit grids. An outfit grid is usually a simply composed layout of several pieces of clothing and accessories, often either folded and placed together on a flat service and photographed as an ensemble, or as separate images of each piece grouped together on websites like polyvore.com or Pinterest. For your purposes, we recommend letting the students lay out the pieces in-store and take as one picture. In the weeks leading up to the event, feature a selection of some of your most eye-catching apparel and accessories in a prominent area or window and put up posters announcing the contest. Don’t forget to advertise the event on your store site and social media accounts! Do you have what it takes to out-outfit your friends? Prove it at the Trick Out My Closet contest at the <store name> July 27th at 4 p.m.! Set a date: Your goal is to get students in the store, so choosing an orientation or open house weekend will maximize the turnout. Pick a place: Designate an area of your store to hold the event. You’ll need a table or other flat surface and at least one staff member on hand throughout to supervise and take pictures. Establish the rules: Set requirements for competing, like how many pieces each grid should contain, or what specific items they must have. Most grids have pants, shorts or a skirt, a top, shoes and an accessory like sunglasses or jewelry. Lay out the pieces: Select a variety of items, making sure to include clothing and accessories to deck out your students from head to toe. To enter, students will choose their favorite items and create outfit grids. The more options you offer, the more creative your students can be with their assembling, so give them plenty of variety. Snap a picture: Once they’ve assembled their outfit to their satisfaction, your staff member will take a picture of the ensemble and post it on Facebook or Instagram, tagging the student and the store with a designated hashtag. Make sure to include clothing and accessories to deck out your students from head to toe. 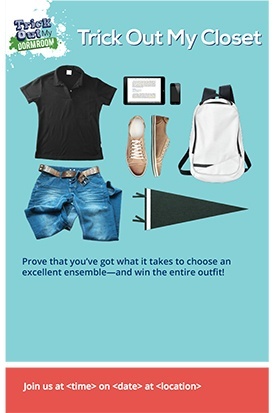 Pick a winner: Every student that successfully put together an outfit will be eligible to win. You can both choose a winner randomly, through an in-store drawing, or crowdsource your Facebook fans or Instagram followers and let them decide. The winner will receive the outfit from their grid, so keep that in mind when you make your selections. Designate a time limit: Since the students will still be acclimating to the new school year, you may want to give them a few weeks to a month to enter. 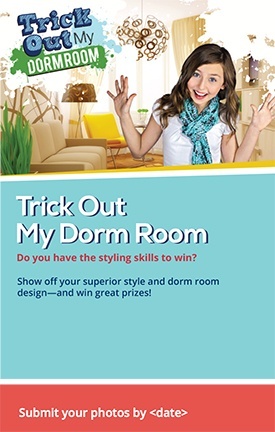 Determine the rules: The goal of this contest is to connect with the new students, but also to promote the dorm-ready items you sell. 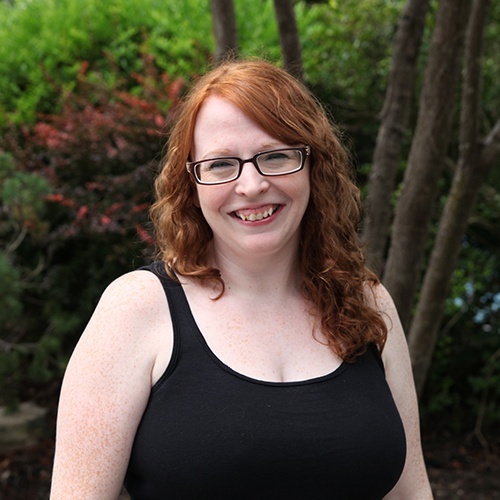 Each entry must visibly include items from your store. How many? You decide! Promote, promote, promote: Let your fans, friends and followers know about the contest. We've made it easy with a customizable poster and Facebook cover photo. Bare walls getting you down? Come to <store name>! We’ve got the dorm room essentials you need. Get ‘em today, and enter to win in our Trick Out Your Dorm contest! Pick a prize: Let them know what they can win, whether it’s a textbook scholarship, store gift card or other merchandise to further accessorize their dorms—or you could even reimburse them for the items they bought with a paid receipt. Take a picture: Have students snap pics of their dorm rooms and submit them to your store. Set rules before you start that take into consideration your school policies, so that there isn’t any confusion about what may disqualify them. Post ‘em and let the people choose: While you could choose to run a timeline contest (if you do, make sure you reference Facebook’s official content rules before you start), using a third party app like OfferPop can simplify the process and make your contest easier to manage. With Offerpop, you will host your contest on a customizable tab, allowing students to easily vote right from your page. Let your fans be the judge to determine a winner. Announce a winner: Spread the word on your social media accounts and in-store. Review the results. After the contests are over, analyze the results. Take into consideration the participation and feedback from your students and staff, and decide what you would change if you ran the events again next year.